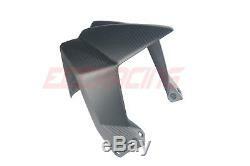 KTM Duke 690 2008 2009 2010 2011 Twill Carbon Fiber Front Fender MATT. High quality TWILL weave carbon fiber surface, fiberglass backing; Epoxy resin for high strength; UV protective clear coat with MATT finishing, no fading; Most of our parts are predrilled, replace the original but will not come with. Hardware/mounting kit/mounting brackets/screws, please use original hardware/mounting kit/mounting brackets/screws. The item "KTM Duke 690 2008 2009 2010 2011 Twill Carbon Fiber Front Fender MATT" is in sale since Wednesday, December 13, 2017. This item is in the category "eBay Motors\Parts & Accessories\Motorcycle Parts\Body & Frame\Fairings & Body Work".